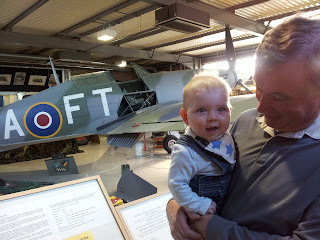 A lovely Thursday with Dylan's grandparents was spent at Manston Spitfire museum. After an Al fresco lunch (Dylan's first), due to the beautifully warm weather we watched the airplanes taking off. Kent international airport is unique in that it is minuscule but still in operation. It consists of one building, no bigger than a large house, and is marked off by a small fence. As it is barely used, and only sporadically has commuter flights it is almost forgotten, but for anyone wanting to see airplanes close up, it is perfect. They fly almost within touching distance, the take off/landing strip is clearly visible, and there is a lovely cafe (where we lunched) looking over the air fields. 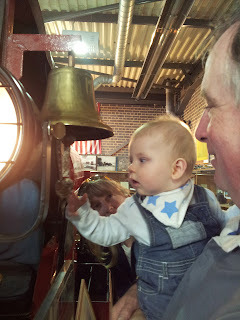 We had a lovely family day out, some fresh air and some history.